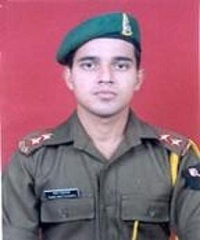 Lieutenant Kanad Bhattacharya hailed from Baranagar in Kolkata in West Bengal. Son of an income tax officer, Lt Kanad was born and brought up at Tala near Shyambazar in north Calcutta. He studied in St. James School and graduated from SA Jaipuria college in Kolkata. Lt Kanad was a keen sportsman during his student days and played cricket very well. He also had an inclination towards martial arts and was a karate black belt holder. Lt Kanad always nursed the idea of joining the armed forces and followed his dream after his college education. and a good cricketer. He joined the Army through OTA and was commissioned into8 Sikh of the famed Sikh Regiment, one of the oldest regiments known for its intrepid soldiers and numerous battle honours. As his first assignment after commissioning, Lt Kanad got posted to the unit which was deployed in J &K and got involved in the Kargil war. There were reports about Pakistani infiltration in May 1999 and Lt Kanad Bhattacharya’s unit was deployed along the LOC near Tiger hill during that time. By the third week of May 1999, the legitimacy of these reports was proven and it had been established that the infiltration had been done on a large scale in various sectors, including the Tiger hill area. Consequently, on 21 May, Lt Kanad Bhattacharya was tasked to establish a foothold on a northeastern ridge near Tiger Hill. The route was inaccessible and was covered with snow. While Sepoy Major Singh was climbing up, he detected movement of intruders coming down with heavy weapons towards them. The intruders started firing at the patrol with heavy automatic and sniper fire. 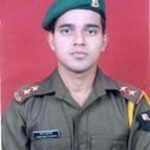 Lt Kanad Bhattacharya and Sepoy Major Singh divided the patrol into two groups and started engaging the intruders from different positions thereby displaying outstanding professional competence. The heavy exchange of fire continued between Lt Kanad’s patrol and the intruders. Lt Kanad and his troops kept constantly returning the fire with grit and determination. In the ensuing firefight, a number of patrol members including Lt Kanad received multiple gunshot wounds. Lt Kanad Bhattacharya later succumbed to his injuries and was martyred. The patrol could not come back and was declared missing in action on 21 May 99. The body of Lt Kanad Bhattacharya was recovered from the area of action on 15 Jul 99 buried in snow after the Indian forces had captured the Tiger Hill. Lt Kanad was a gallant soldier and a fine officer who laid down his life in the service of the nation at the young age of 22 years. Lt Kanad Bhattacharya was awarded “Sena Medal” (Posthumous) for his courage, unyielding fighting spirit and supreme sacrifice. Lt Kanad Bhattacharya is survived by his mother Purnima and sisters Purba Bhattacharya & Jaba Bhattacharya. “Calcutta bids adieu to martyr’ – ‘Capt Kanad Bhattacharya, the first Kargil martyr from the city, was cremated with full military honours at Nimtollaghat in North Calcutta today. Braving a steady drizzle, hundreds of people, mostly youth, gathered at the historic crematorium since morning to pay their last respects to the 25-year-old hero”. I have nostalgic memories of kanad as it was a previledge for me to be part of the same platoon and get trained together while at OTA. A very soft spoken and humble soul with a determination to overcome all eventualities .You were a dead sinker but learned swimming in no time and passed with flying colors.You were not cowed down by the enemies and fought with courage and grit.. Your matryodom was amoung the cost this country bore to win the war .We salute you buddy for the freedom we enjoy has been paved with your blood..You are always part of our thought and will remain till we remain.The brave never die there courage nerve millions.. I salute u my comrade……u acheived wat v only cud dream of it. I take pride by saying ur my coursemate n vl remain so ….miss u my buddy. Jai hind ! A well bred thorough gentleman and a pure soul. He was dear to God so the Almighty took him away at a tender age, glorifying him with the Tri Colour. An appeal to today’s youth – imbibe such bravado and revel in selfless service to the Nation. My beloved Kanad you will remain in my memories for ever….. Salute buddy as Ex Meiktilian. We are indebted to you…Salute to a brave soldier, a brave man n a brave human being. JAI HIND. RIP Sir, we won’t forget. Jai Hind. I wasted my life, if there is anything in the next birth, then I can join the Indian Army. Salute. Every day when I go to work and return to home I watch your statue and feel very sad as well as very proud of you.